This month sees a welcome return to the Sussex big band scene of the One World Orchestra, with their appropriately named Bonfire! performance at the Unitarian Church in central Brighton. Details are in the listings below. This Sussex based ensemble, formerly The Paul Busby Big Band, changed its name a couple of years ago, when Paul retired as leader. However his music still forms the bulk of the repertoire, including charts written since his withdrawal from regular active participation. So his music is a substantial feature of this concert, with selections from his East Sussex Suite, as well as some of his more recent writing together with compositions from other members of this talented group. The band has a nucleus of strong soloists, many of whom have played in high profile bands. The profits from the evening are to be shared between Clocktower Trust (supporting homeless young people in Brighton and Hove), Thousand 4 1000 (finding homes for people seeking sanctuary from war, persecution and severe economic hardship) and the Brighton Unitarian Church building fund. To find out more, you can go to www.oneworldorchestra.co.uk or the band’s Facebook page. And while on the subject of Facebook, over the last few months several big band gigs have not appeared in the listings at the foot of this column. In some cases it is because I wasn’t sent the information in time, in others, I suspect that the band or the gig organizers were unaware of the existence of the magazine. So it is worthwhile, as I have mentioned in the past, checking out the Facebook page Big Bands of Brighton. Meanwhile, the Big Band@Brunswick series of events continues to flourish. Sometimes with additional events later in the month. Although some of these ‘big bands’ don’t quite meet my criteria for inclusion in my listings. For example there should be at least seven horns. 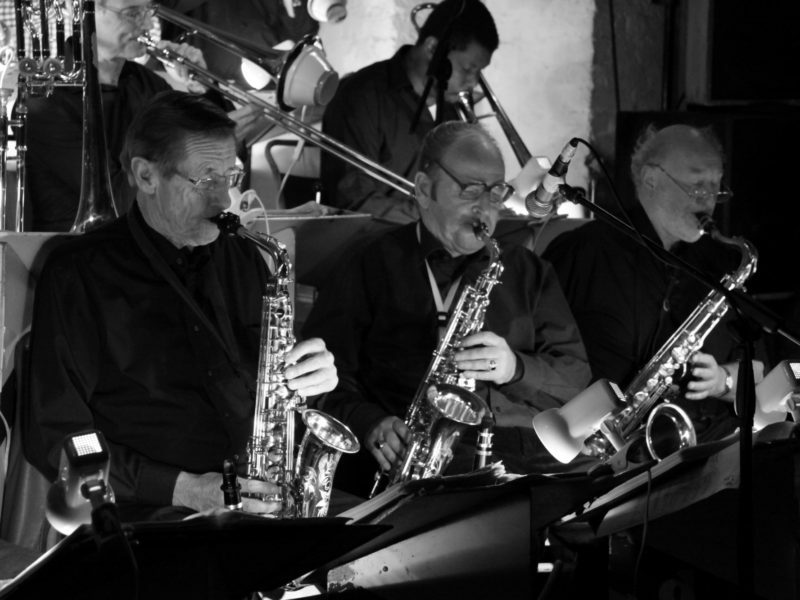 Last month the Brighton Big Band filled the slot, with local singer Dave ‘Sinatra’ Williams providing the vocal element. The middle of each set was enlivened by guest lead alto, Robin Blakeman, featured in charts from Oliver Nelson’s Black, Brown and Beautiful suite. This month the Sussex Jazz Orchestra is on the schedule. The band is joined by trumpeter Henry Lowther (pictured, above). Henry was a close associate of the band’s creator, the late, great, Ian Hamer, and will be featured in several of Ian’s compositions and arrangements. You may have noticed in the big band listings at the foot of this column during the Summer months, mention of the regular weekly Big Band Sound Thursday evening series on Eastbourne Bandstand. Now known as Big Band and Swing Sound. Planning the 2019 programme is under way. If you are interested in taking part, you should download the application forms from http://www.eastbournebandstand.co.uk/contact-us/performer-pages/. You should say which dates your band is available, and once the applications are in, you may be offered one. Or, as last year, when only three bands applied, up to three. Take careful note of the requirements; the concerts start at 8pm and finish by 9:30pm without an interval. The set list, with composers and arrangers, must be submitted at least two weeks before the gig to: prs@eastbournebandstand.co.uk. The band earns £300 for each performance, but it is worth bearing in mind that if you overrun the finish time, the bandstand staff are still paid, but it comes out of your fee, rather than the local Council Tax. I couldn’t find a closing date for applications, but I suspect it is soon, as the programme for the following year is usually published in December. 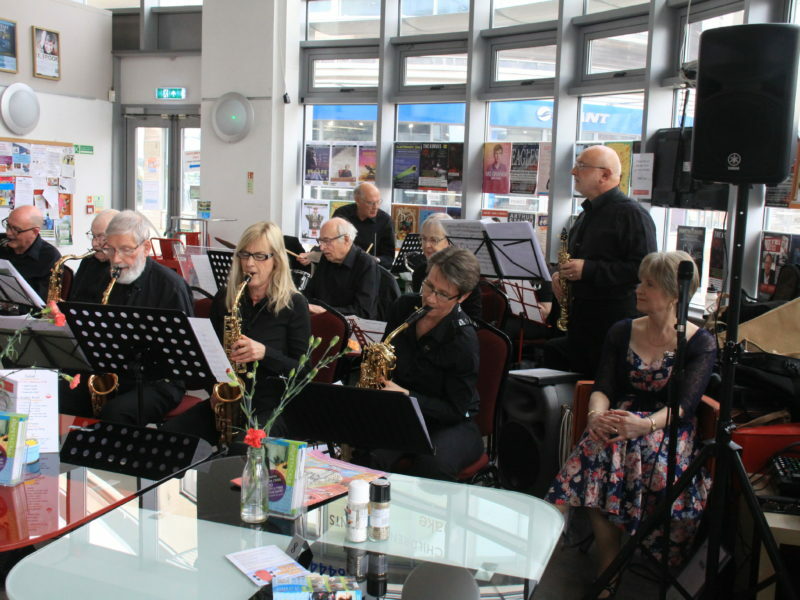 7:30 – 10:30 pm, Big Band @Brunswick: The Sussex Jazz Orchestra, featuring guest star Henry Lowther, at The Brunswick, 3, Holland Road, Hove BN3 1JF (01273 733984). Free entry with collection. 8:00 pm, The One World Orchestra – Bonfire! at The Brighton Unitarian Church, New Road, Brighton, BN1 1UF (01273 696022). £8. Tickets can be purchased from the church, via the orchestra’s website or at the door. Doors open 7:30. 8:15 – 10:00 pm, Downsbeat Swing Band at The Village Centre Hall, Trinity Road, Hurstpierpoint, West Sussex, BN6 8UU (01273 833264). Free entry with collection for the Motor Neurone Disease Association. 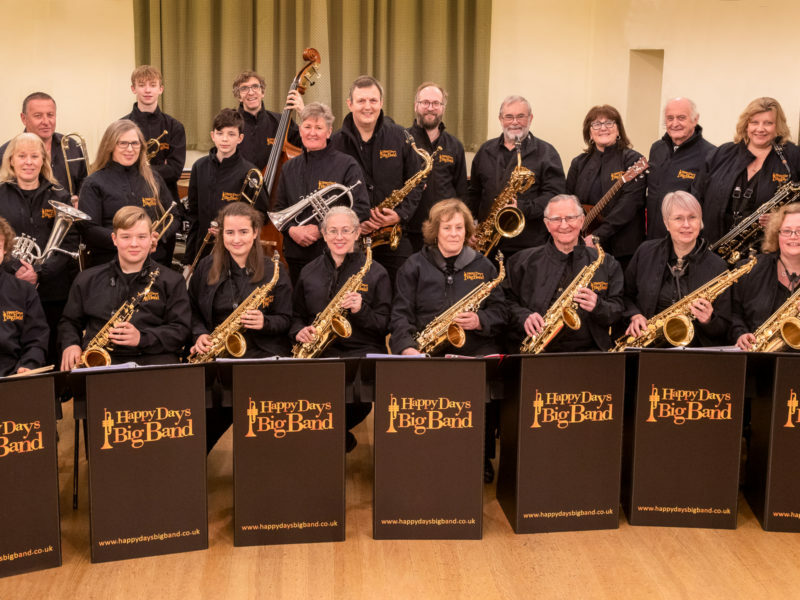 8:00 – 10:30 pm, The Simon Bates Big Band at Loxwood Jazz and Blues Club, Loxwood Village Hall, Guildford Road, Loxwood, West Sussex, RH14 0SF (07564 347478). £15. 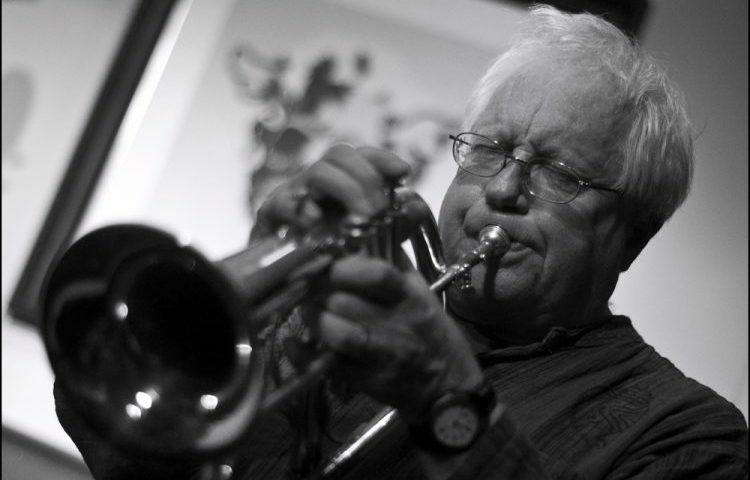 7:30 – 10:30 pm, Big Band @Brunswick: Terry Pack’s Trees at The Brunswick, 3, Holland Road, Hove BN3 1JF (01273 733984). Free entry with collection. Next month: Hopefully another band profile, and more news about big bands based in, or appearing in, the county. If you would like your band featured, and I have not already contacted you, please get in touch. Anything else, such as gig news, or feedback on this column, that you would like me to include in December’s Big Band Scene, please send it to me by Monday November 12th. This is much earlier than usual because I shall be away. My email address is g8aac@yahoo.co.uk.